A compendium of questions from Billy Whizz to Father Ted. The Picture Round is name the Cartoon Canines and the Wild Card is guess the stat about a Blue Peter presenter and the London Marathon. Q04. Dennis the Menace and Billy Whizz are both characters from which long running British children’s comic? Q16. Ice Ice Baby reached the UK number one slot in 1990 for which American rapper? Q24. Which famousEuropean football team is nicknamed the Merengues? Q39. In the Channel 4 comedy series Father Ted what was the name of the actor who played Father Dougal McGuire? 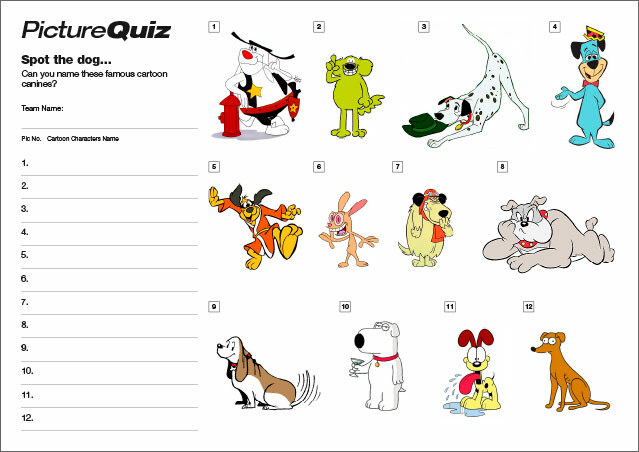 The Quiz 074 Picture Round is can you name these famous Cartoon Canines? Above is a low-res sample of the Cartoon Canines Picture Round, click for a higher resolution version. The Picture Round download is a two page high quality PDF with the answers on page two. Quiz 074s Wild Card Question is a statistic about a Blue Peter presenter called Peter running the London Marathon.